Also compare status of our cases in developing nation with the studies of similar nature in the developed countries. A total of 34 cases were studied. Thirty were hysterectomy with staging laparotomy whereas four were only endometrial biopsies. In the latter, no hysterectomy had been done at the center of the study and cases had been lost to follow-up. The age of the cases ranged from 35 to 85 years. Mean age being 60.36 years. The association of hormonal receptor status and age is tabulated in [Table 1]. Twenty-four out of 34 (70.6%) cases were ER/PR positive. The mean age of ER/PR-positive and negative cases was 58.87 and 63.16 years, respectively. [Figure 1] shows the ER/PR status of cases. Seven out of 34 (20.59%) cases were premenopausal while 27/34 (79.41%) were postmenopausal. Thirty-two out of 34 cases were of endometrioid type of endometrial carcinoma as only two cases were of serous papillary. The association of menstrual status with histological type is tabulated in [Table 2]. The association of histological grade with mean age is tabulated in [Table 3]. Sixteen out of 34 (47.05%), 7/34 (20.5%), and 11/34 (32.35%) cases were Grade I, II, and III, respectively. There were seven premenopausal cases, five Grade I and two were Grade II. Two cases of serous papillary carcinoma are included with Grade III for evaluation. The mean of age for the various grades is also tabulated. The mean age of the cases were found to be increasing with increase in histological grade. 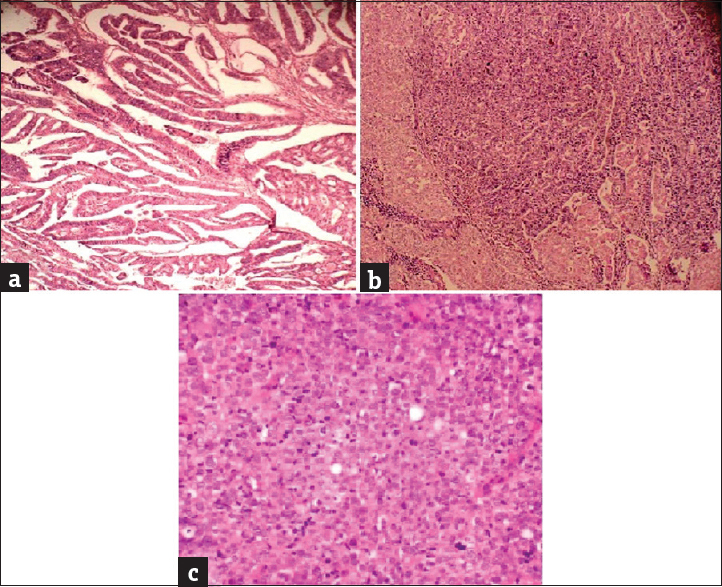 [Figure 2] depicts three cases with different histological grades. The association of hormonal receptor status with grade of lesion is tabulated in [Table 3]. Low histological grade was found to associated with positive hormonal receptor status. The association was significant with P = 0.01. The association of hormonal receptor status with MIB-1 score of lesion is tabulated in [Table 4]. The association was significant with P = 0.0009. Positive hormonal receptor status was associated with lower MIB-1 score. Both the cases of serous papillary adenocarcinoma were in the hormonal receptor status-negative category with >50% MIB-1 score. [Figure 3] depicts two cases with very low and very high MIB-1 scores (×100). The association of hormonal receptor status with depth of myometrial invasion is tabulated in [Table 5]. Only 30 cases which had undergone hysterectomy were included in the present evaluation. The association was not found to be significant with P = 0.54. [Figure 4] depicts two cases with less than and more than 50% myometrial invasion (×100). The association of hormonal receptor with nodal metastatic status is also tabulated in [Table 5]. Only 30 cases which had undergone hysterectomy with staging laparotomy were included in the present evaluation. The association was not found to be significant with P = 0.19. World Cancer Research Fund International. Cancer Facts and Figures: Endometrial Cancer Rates. Available from: http://www.wcrf.org/cancer_statistics/cancer_facts/endometrial_cancer_rates.php. [Last accessed on 2016 Sep 20]. Wei JJ, Paintal A, Keh P. Histologic and immunohistochemical analyses of endometrial carcinomas: Experiences from endometrial biopsies in 358 consultation cases. Arch Pathol Lab Med 2013;137:1574-83. Prat J, Gallardo A, Cuatrecasas M, Catasús L. Endometrial carcinoma: Pathology and genetics. Pathology 2007;39:72-87. Wang Y, Ma XL, Xi CG, Lin J, Ren CX, Liu CR. 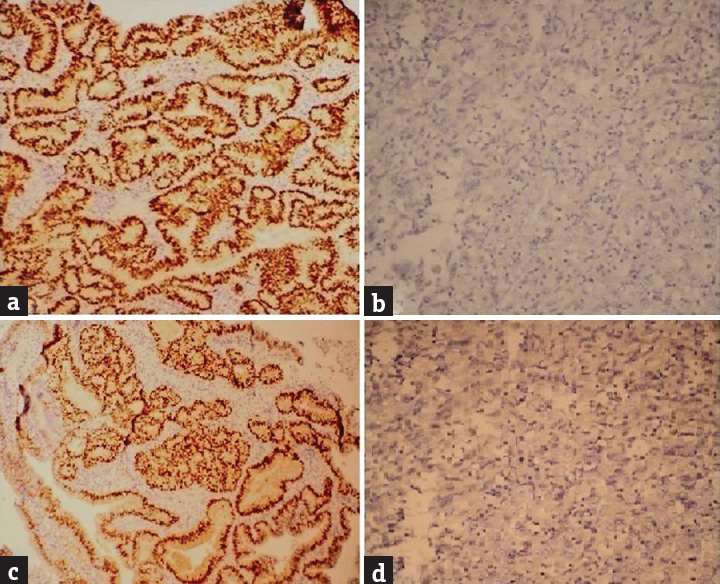 Correlation between estrogen receptor status and clinicopathologic parameters in endometrial cancer: A comparative study by immunohistochemistry using different scoring systems. Zhonghua Bing Li Xue Za Zhi 2013;42:509-14. Srijaipracharoen S, Tangjitgamol S, Tanvanich S, Manusirivithaya S, Khunnarong J, Thavaramara T, et al. Expression of ER, PR, and Her-2/neu in endometrial cancer: A clinicopathological study. Asian Pac J Cancer Prev 2010;11:215-20. Kumari PR, Renuka IV, Apuroopa M, Chaganti PD. A study of expression of estrogen and progesterone receptor, in atrophic, hyperplastic and malignant endometrial lesions, with emphasis on relationship with prognostic parameters. Int J Res Med Sci 2015;3:3318-25. Kounelis S, Kapranos N, Kouri E, Coppola D, Papadaki H, Jones MW. Immunohistochemical profile of endometrial adenocarcinoma: A study of 61 cases and review of the literature. Mod Pathol 2000;13:379-88. Zidan AA, Hassan AA, Abu Seadah SS, Ibrahim EH, Attiah SM. Selected immunohistochemical prognostic factors in endometrial hyperplasia versus carcinoma. J Am Sci 2015;11:1-9. Trovik J, Wik E, Werner HM, Krakstad C, Helland H, Vandenput I, et al. Hormone receptor loss in endometrial carcinoma curettage predicts lymph node metastasis and poor outcome in prospective multicentre trial. Eur J Cancer 2013;49:3431-41. Stoian SC, Simionescu C, Margaritescu C, Stepan A, Nurciu M. Endometrial carcinomas: Correlation between ER, PR, Ki67 status and histopathological prognostic parameters. Rom J Morphol Embryol 2011;52:631-6. Ferrandina G, Ranelletti FO, Gallotta V, Martinelli E, Zannoni GF, Gessi M, et al. Expression of cyclooxygenase-2 (COX-2), receptors for estrogen (ER), and progesterone (PR), p53, ki67, and neu protein in endometrial cancer. Gynecol Oncol 2005;98:383-9. Yang B, Shan B, Xue X, Wang H, Shan W, Ning C, et al. Predicting lymph node metastasis in endometrial cancer using serum CA125 combined with immunohistochemical markers PR and Ki67, and a comparison with other prediction models. PLoS One 2016;11:e0155145.